020090227 Filed under books, umwelt. Bookmark the permalink. 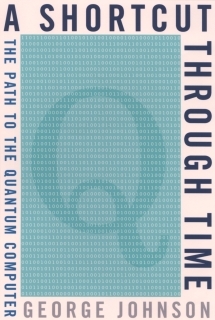 Just finished reading ‘A Shortcut through Time’, by George Johnson, a popular-scientific book explaining some of the ideas behind quantum computing. I thought it was a slightly disappointing book, for a number of reasons that do not have much to do with the author or his writing. People devising quantum algorithms are ‘writing software for hardware that doesn’t exist yet’, which in itself is extremely interesting, but it seems that it is very early days indeed. You get the feeling that Charles Babbage was mentally a lot closer to the modern ‘classical’ computer than these people are to what quantum computing could be. Because of that distance, quantum computing is a bit like a black box in which all kinds of marvels (and hopes) can be projected. And the weirdness of quanta makes our computers look very much 19th century at the core. While reading the book, even though it is very clearly written, quantum dynamics just stays extremely weird; there is no way you can get a feel for it. So far the ‘QED’ book by Feynman is still the most clear explanation I am aware of, and he basically tells us to give up trying to picture it and move on. I suppose we need more games like “Quantum Tic-Tac-Toe“, but that still seems to be the only quantum game around, although I’ve heard of a game called “Quantum Minigolf”. Such games could be one nice way to become more familiar with quantum mechanisms, and who knows, we might start seeing quantum-like patterns in our everyday world. And we need lots of quantum science-fiction too..